The Unemployment Extension bill failed by a vote of 261-155...it failed by 16 votes - it needed 277 to pass under the suspension of the rules. As you can see in the House Image below - 8 Democrats did not vote - and 16 Democrats voted Nay - this was exactly the 16 needed votes to have passed this bill. So, how is it possible that Republicans could be blamed for stopping this bill in its tracks? 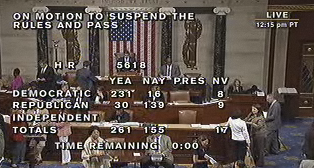 With the Republican 30 votes the Democrats had the numbers to have PASSED it by 16-24 votes. Instead unemployed Americans anger and anxiety is directed, by The Dem's, Pelosi, and Obama, at the Republicans, portraying that they killed people's extension hopes, while playing this political emotion game. Sixteen Nays, Nancy. Where was the urgency of now arm twisting? And Obama, who has told us that "information is a distraction," continues to use misinformation to polarize, agitate, divide, and distract. What Obama didn't say while on his National disinformation soapbox, purposely scaring families, is there was a Republican Bill extending benefits until November - or that this Bill's passage was 16 votes short and that the 16 Democrats who voted NO killed this bill - and THAT the Dem's had plans already to bring this Bill to the floor again within days in which the Bill would face a much lower simple-majority 219-vote threshold. “It will pass,” said Rep. Sander Levin (D-Mich.) who added that he is coordinating with his counterparts in the Senate. So why the Obama obstruction of truth with this paralyzing subterfuge? To blame the Republicans of course. Then to win one for 'the people' a few days later. The extension- good or bad - as a pay as you go debt platform is a whole different story. This one is about manipulation of people's fear, being used as political pawns, and keeping people divided and angry. How would you get exactly the 16 NO votes, short of passage, without tactical coordination? The Bill did pass on Friday 7/2/10. is being put on hold. All those who have to vote on this matter are not going hungry, bills not being paid.